When it comes to getting married, every couple has a unique story to tell. 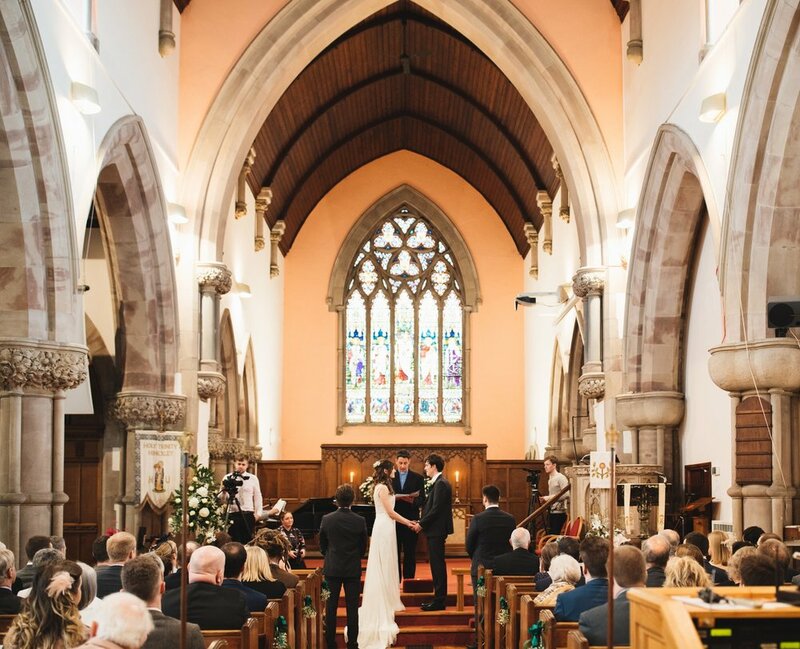 At Holy Trinity, we believe that weddings should be an opportunity to reflect your personal journey, and a wedding in Church and before God is a fantastic start for your life together. We know there are lots of questions when it comes to weddings, so we've tried to answer some of the most common ones below. After that, please do go ahead and fill out the enquiry form at the bottom, where we've included a space for you to ask anything we haven't covered! Are we eligible to get married at Holy trinity? In order to get married at Holy Trinity, you must meet at least one 'Qualifying Connection' with the church. Only one of either the Bride or Groom needs to meet this connection, and the options include things like living in the parish, attending services here, or having parents who attended or were married here. Get in touch with us, and we can establish if you have a qualifying connection. If not, you can do so by joining us on Sundays for 6 months. Further information about Church of England Weddings can be found here. How much does it cost to get married at Holy trinity? Not the most romantic question, perhaps - but a significant one. It costs the same to get married at Holy Trinity as it does any other Church of England church, as these fees are set nationally. They do rise slightly each year with inflation, but for 2018 a basic wedding ceremony costs £448. However, there are some additional options which you may like to include (such as a Pianist/Organist, a Verger, or a Video Licence), and these vary in price from £25-£50. You can book a wedding and get married in a matter of months. However, we generally find that a year to eighteen months in advance is the most helpful timescale to be thinking about - although we do understand that some couples wish to book earlier and later than this. If you have a specific date in mind, do let us know before you make other arrangements, such as to a reception venue. i've been divorced before. What's your policy in this instance? At Holy Trinity we want to affirm that, as the Bible teaches and each couple promises on their wedding day, marriage should be lifelong. Therefore we don't conduct wedding services for second marriages of people who have been divorced (if their previous spouse is still living). However, we do understand that some marriages sadly end in divorce and people sometimes want to marry again. We want to support couples in this situation, and so we offer a service of blessing after civil marriage. This enables you to have a church ceremony to invite family and friends to, and is an opportunity for us to pray for you and ask God's blessing upon your marriage. If you have any questions about this please do contact us. interested? then do get in touch! We would love to speak with you in more detail about the possibility of getting married at Holy Trinity. If at this stage you just have some questions you'd like to ask us - please contact the Church Office. However, if you would like to pursue getting married at Holy Trinity - please fill in the form below, and our Vicar, Simon Wearn, will be in touch to arrange to meet with you. Please include any middle names too. If you're not sure of the exact day, please put the 1st of the month you moved in. Please enter the Groom's age at your proposed wedding date. If the Groom's Father is retired, unemployed, or deceased, please enter their last known occupation instead. Please select one of the options below to describe the Groom's Father's current status. Please enter the Bride's age at your proposed wedding date. If the Bride's Father is retired, unemployed or deceased, please enter his last known occupation. Please select one of the options below to describe the Bride's Father's current status. Please select an option that best describes your connection to Holy Trinity. The option you choose only needs to apply to one of you.